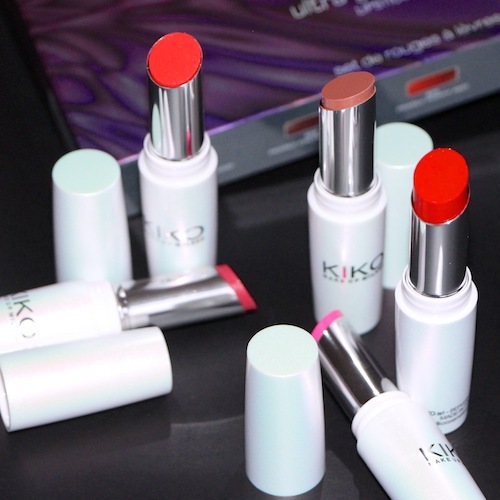 I really like the Ultra Glossy Stylo lipsticks from KIKO. When I visited their flagship store in Rome last year, I spent nearly twenty minutes trying on different shades and I was very impressed by the formula; glossy, non-drying and with good hold. A great range of colours, too, and the overall quality is as good as (if not better than) some of the far more expensive brands. Individual lipsticks cost £4.90 which makes them an excellent way of test-driving a new shade or makeup look without any dire financial commitment! The set of five, pictured above, is particularly good value – now £11.20 in the sale. I’ll let you do the maths. I’m afraid my moody Christmas lighting doesn’t show the shades off quite as well as it could – there’s actually a very nice range of lipsticks from hot fuchsia and the brightest poppy red to a please-all neutral. Worth taking a look at if you’re new to lipstick and want to experiment. KIKO have also opened up a store on Regent Street in London, so if you’re visiting then add it to your Beauty Shopping Destinations list – it’s full of useful tools and just about every makeup item you could possibly wish for.